In her poem "Janie Talkin in her Sleep," Rachel Eliza Griffiths takes on the persona of the protagonist of Zora Neale Hurston's Their Eyes Were Watching God. We often talk about "entering a conversation" with authors, and Griffiths really takes that idea to the next level by writing/speaking as Janie. The poem opens: "I swear on de life of a pear, / a part of me died / when mah finger, / like an enemy of de Lawd, / pulled de trigger / on mah sweet boy." Here, the poems references the moment toward the end of Hurston's novel where Janie is forced to shoot and ultimately kill her man Teacake as he attempts to kill her. The poem is mournful and bluesy even--filled with Janie's grief and at the same time a poignant lyricism conveyed through Griffiths's word choices, phrasings, and line breaks. The work configures Janie as inclined to present her tragic loss in verse or song. 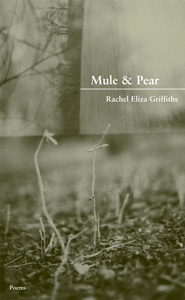 When I opened Mule & Pear for the first time and scanned the table of contents, I turned to this poem first. I figured, after noting that Hurston was one of the people that Griffiths had dedicated the poem to, that the Janie of the title was the Janie of Their Eyes Were Watching God. "Janie Talkin' in Her Sleep" is relatively, but given my many previous interactions with Hurston's novel, the poem seemed to linger with me for a while. I began thinking about the place where Hurston's Janie ends and where Griffiths's Janie begins.